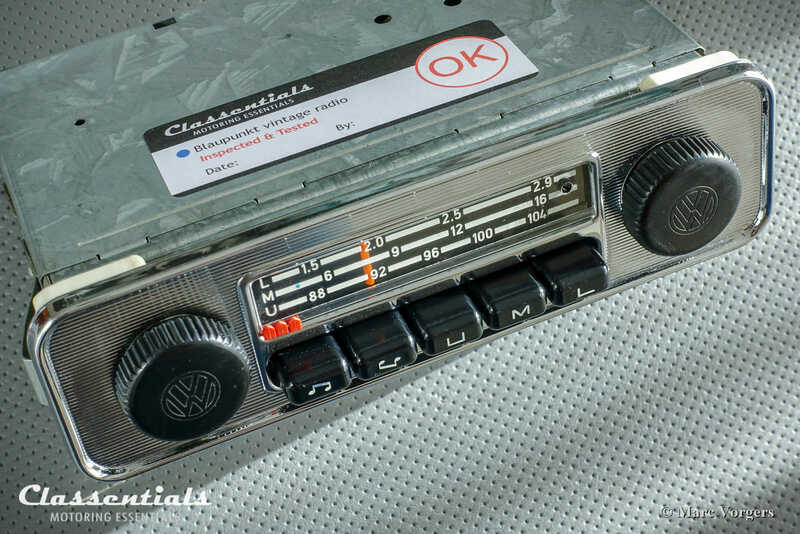 Here we have a gorgeous vintage original 1971 Blaupunkt Emden AU classic car auto radio for Volkswagen Beetle cars 1968 – 1973 featuring a metal dashboard! 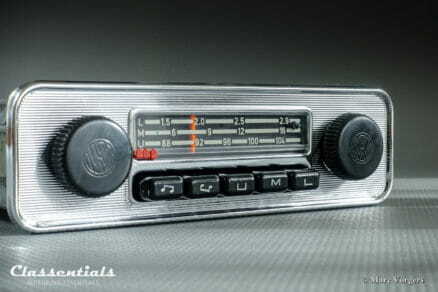 This radio was an optional factory accessory, the Emden AU was especially made for Volkswagen cars. 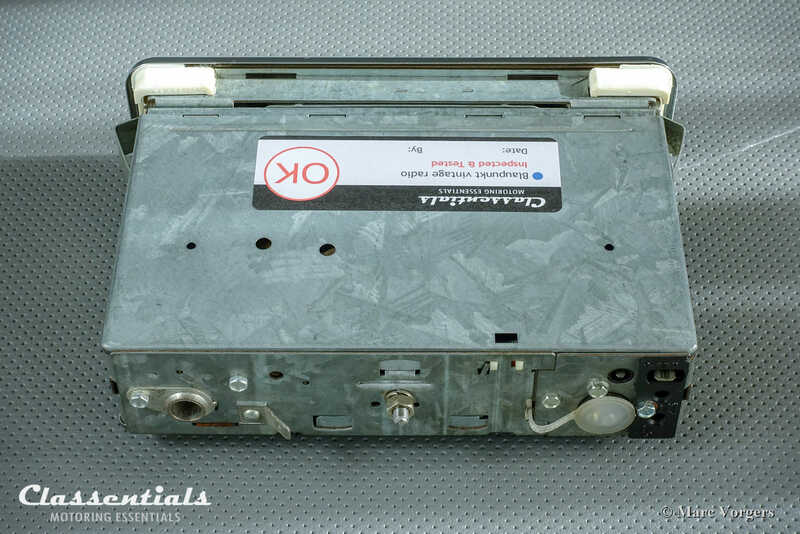 This SUPERB radio was fully serviced and refurbished in our workshop to TOP condition! 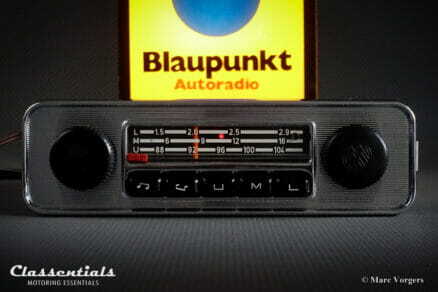 The Blaupunkt Emden AU features medium wave, long wave and the important FM wave reception. Furthermore, push-button tone control and a DIN socket are available. 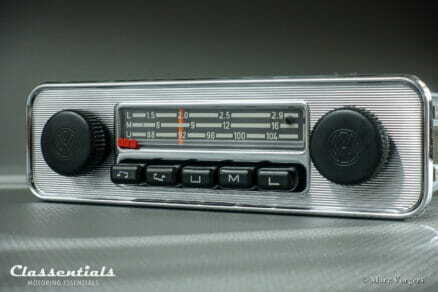 The radio is finished with a very desirable ORIGINAL full chrome metal VW Beetle ‘pin-stripe’ face-plate in like new condition, and the correct original VW Beetle knobs. This radio is fully original as delivered by the fasctory. This fine radio will be a stylish and PERIOD CORRECT addition to your VW Beetle! This radio will upgrade your classic Beetle and it will enhance your driving experience because the dashboard is what YOU are looking at while enjoying your car! This Blaupunkt mono auto radio is MP3 / Bluetooth ready featuring a DIN socket to connect an external device. 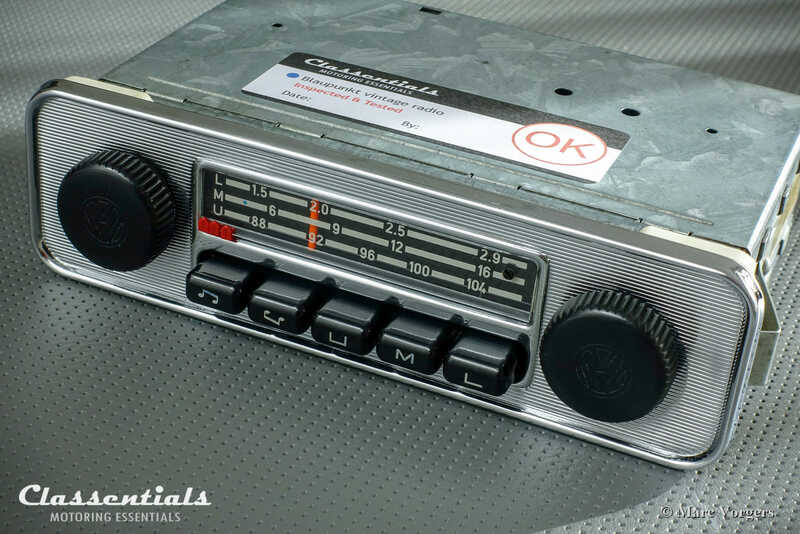 You can buy this auto radio in a package deal complete with a Classentials de Luxe mono MP3 Kit OR a wireless mono radio Bluetooth Module! CLICK HERE. 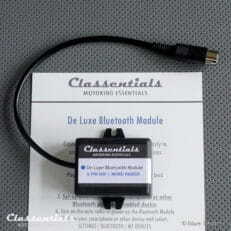 Add the radio and the mono MP3 KIT / mono Bluetooth module to your shopping basket. Then enter the Coupon code MP3Mand you will get 20 Euro discount on the combination purchase! 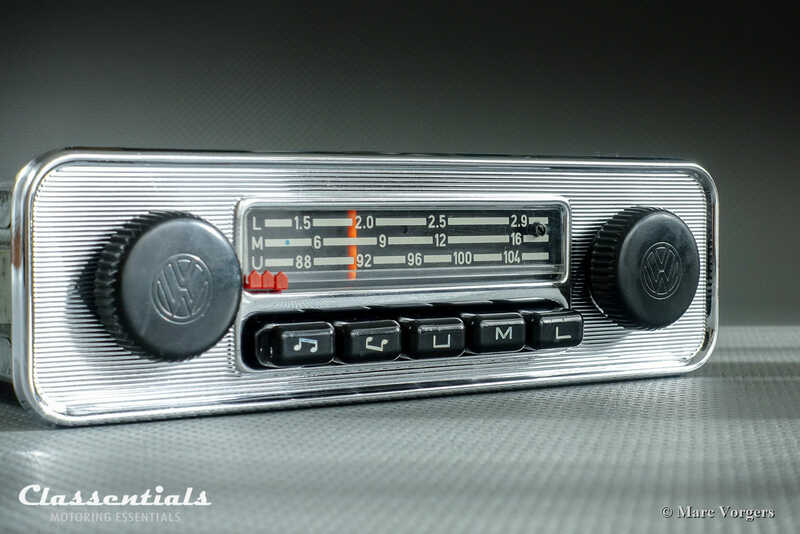 The radio features a special integrated dashboard mount with side-clamps for VW. 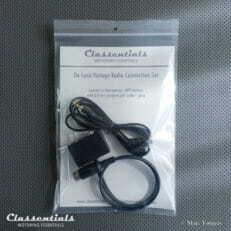 The radio is easy to install with the guidance and the parts supplied in the Classentials Installation Kit. 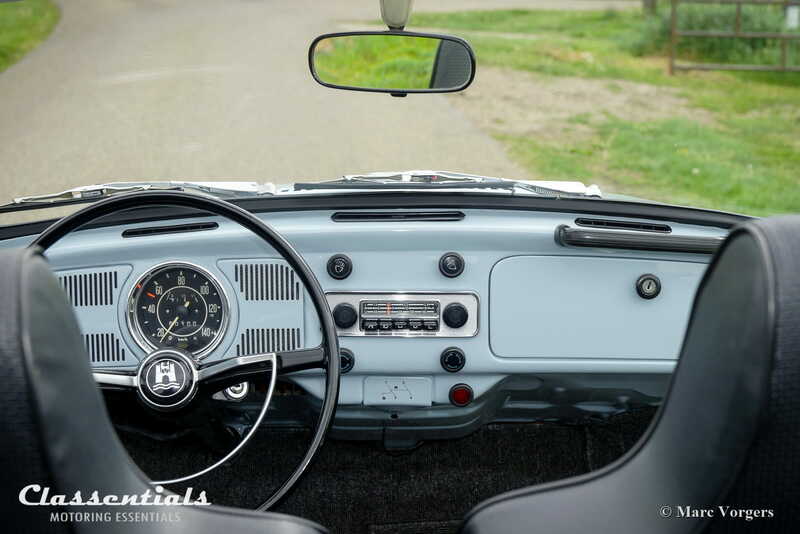 Enjoy the sound of the 1960s and 1970s via your dashboard speaker or add an extra speaker in the rear to surround yourself with music. 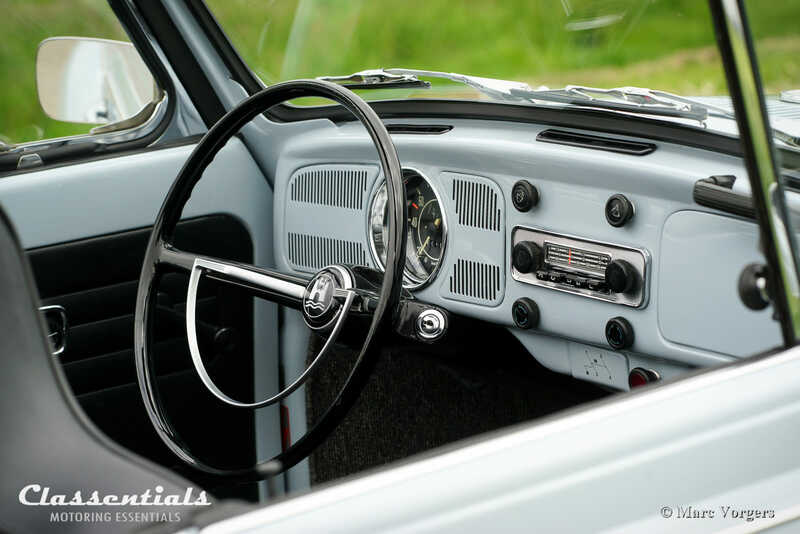 The radio is being delivered with the complete Classentials installation kit (installation instructions, speaker plug, cable-shoes, ground cable, fuse etc), all the essentials you need to properly install the radio in your VW Beetle with the metal dashboard. *1.5 years (18 months) European / US warranty (See About Us / FAQ). Face-plate: Original Metal Chrome VW Beetle ‘pin-stripe’ face-plate for 1968 – 1973 VW Beetle cars featuring the metal dashboard. 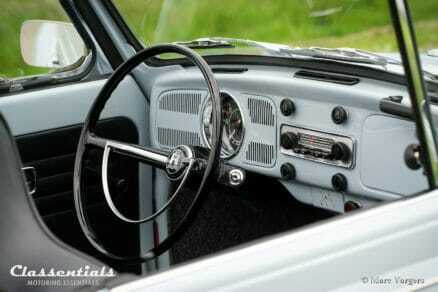 Fitted the correct original VW knobs and integrated dashboard mount with side-clips. Rendition: Mono, 1 (4 Ohm) speaker. NOTE: If you want to connect two speakers then you have to use two 8 Ohm speakers connected parallel + to + and – to -, this makes 4 Ohm. This is important otherwise you will damage the internal amplifier. 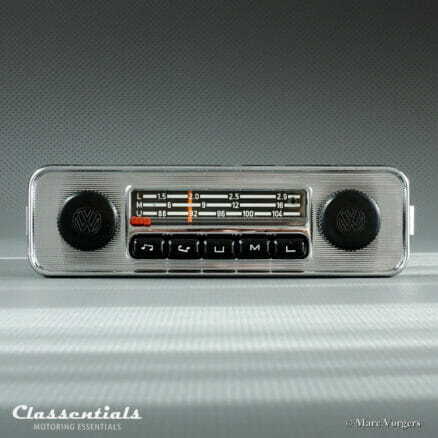 Equipment: Tone push buttons, DIN connection for optional external devices (in period cassette players) like the Classentials MP3 kit and the Classentials Bluetooth module. 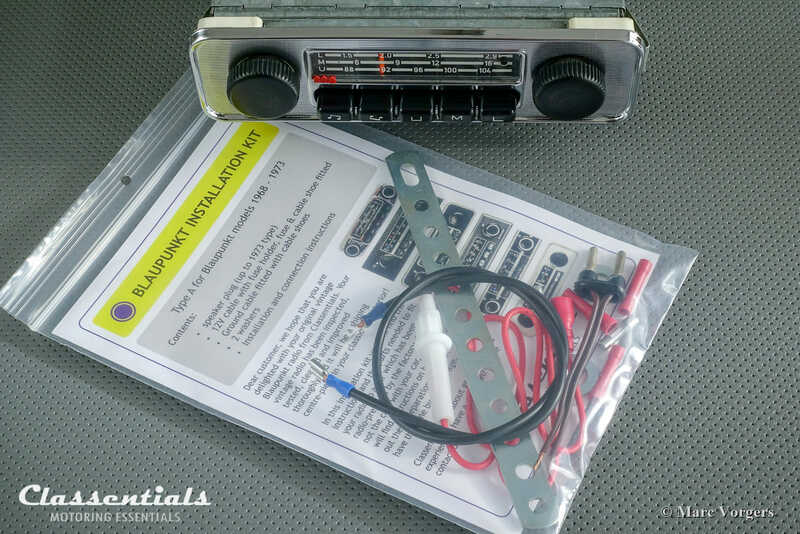 Extra in packaging: Classentials Installation Kit 1 with installation instructions, old style speaker plug, earth cable, 12V wire with fuse, cable shoes and a metal strip with 6 mm holes to form a rear radio support bracket if not present in your car. Installing: Basic car conditions before installation: Radio prepared car with dashboard openings, 12V power lead (negative ground), analog telescopic antenna, standard (dashboard speaker) with wiring. Tools needed: wrench number 14 and 8, cable shoe pliers. 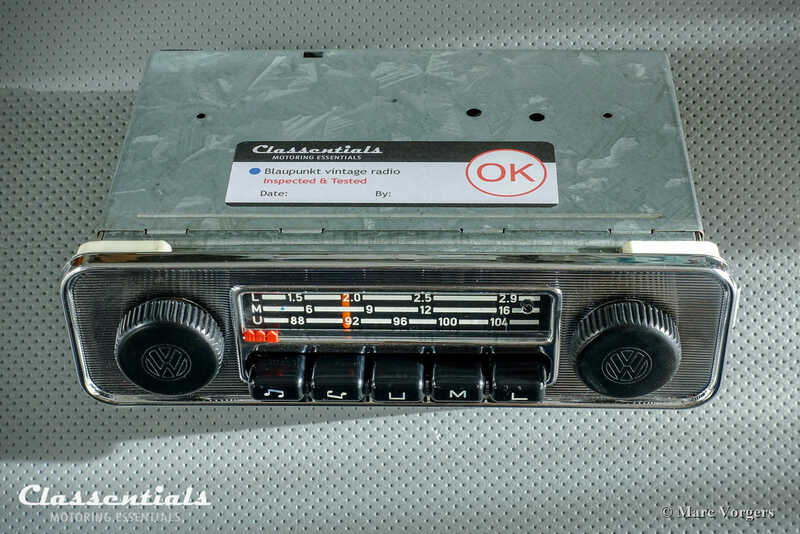 Handy customers experienced with working and tinkering on classic cars can install a radio by themselves. 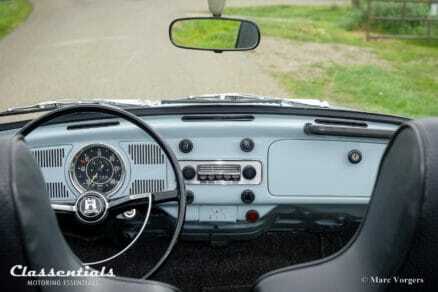 All others we strictly advise to have their vintage radio installed by an experienced mechanic / electrician / local garage. Our installation kits contain the parts and instructions needed to install a radio in a factory original prepared car. In case your dashboard aperture / mount has been changed by previous owners over the last 40 -50 years you might need, or have to make, different parts to make the radio fit properly. *1.5 years (18 months) European / US warranty (See About Us / FAQ). 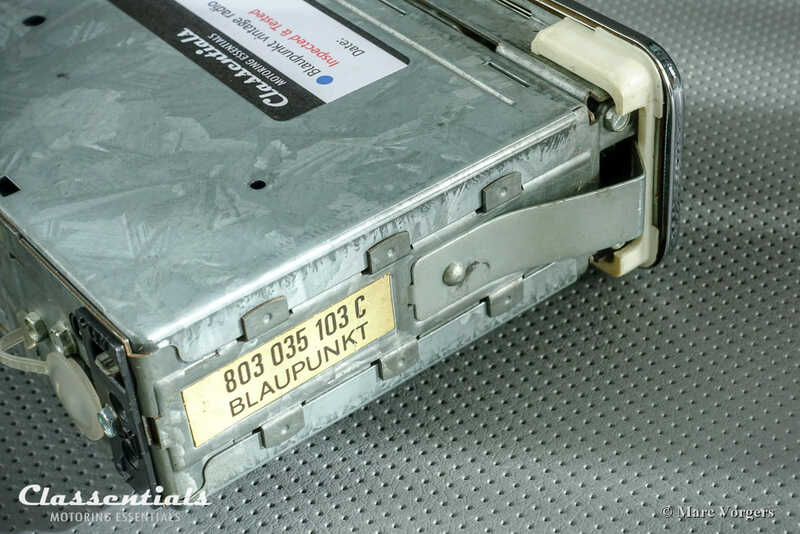 In the rare case that a reliable Blaupunkt transistor radio stops working you send it back to us for immediate exchange (in case a comparable unit is in stock) or repair. The radio is sealed before shipping with a unique numbered security seal which cannot be tampered with. If this seal is damaged / broken the warranty will be void.